My analysis has shown that up to the end of the last quarter, first time buyers in Worthing purchased 558 properties in area. With wages rising at 2.8%, unemployment at a low rate of 4.2% (down from 4.6% from a year earlier and the joint lowest since 1975), national GDP rising at 1.87% and inflation at 2.3%, tied in with indifferent house price growth (compared to a few years ago), this has given first time buyers a chance to get a foot hold in the Worthing property market. Over the last year, the average purchase price paid by a first time buyer in Worthing has been £220,300 and the average deposit was £35,689. Furthermore, my calculations show the average Worthing parents contributed £15,614 of that £35,689 figure. You see `The Bank of Mum and Dad (Worthing Branch)` is, for countless Worthing twenty something`s, perceived to be the only way they will ever be able to afford their first home. In fact, parents in Worthing put up a substantial £8.71m in the last 12 months to help their children onto the property ladder. 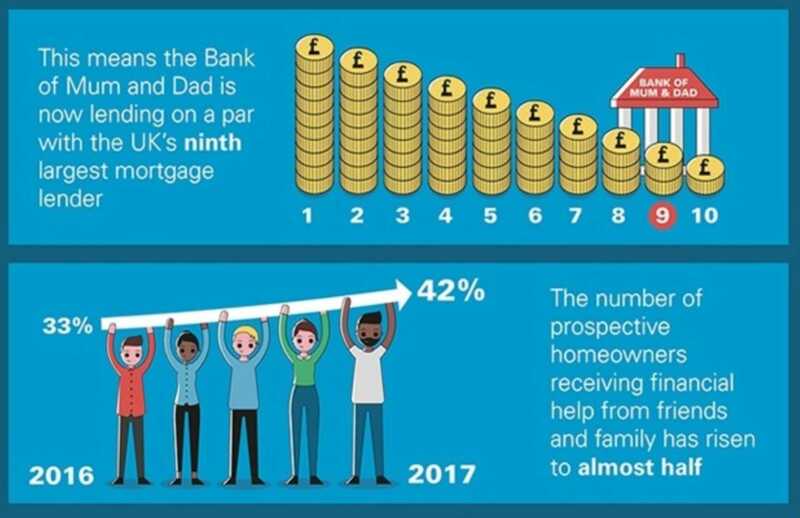 This assistance towards the deposit makes a huge difference, enabling those who thought they couldn`t get on the housing ladder to do so more easily. With mortgage rates at all-time lows, few Worthing twenty something`s would struggle to make mortgage repayments – it`s the requirement of the deposit which is the issue. Although parents (and grandparents) are helping out where they can, it does little to address the real problems of the housing market, whether for people renting or buying their first home. But before I leave this article, note I used the word PERCEIVED in a previous paragraph. Yes, the average first time buyer deposit is 16.1%, but that is an average. Did you know 95% mortgages returned for first time buyers in late 2009 and have been available ever since? Also, lenders like Barclays and many local Building Society`s now offer 100% mortgages (i.e. no deposit). The perception is you need 15%, 20% even a 25% deposit to be a first-time buyer – you don`t! You don`t need any deposit, but (there is always a but!). Over the last decade, many renters have upgraded themselves into homes that they (or any generation before them) could never have afforded as a first time buyer in the past. The British housing market started to change with the dawn of the new Millennium and I am seeing a slow but steady attitude change when it comes to renting. Tenants have found the price difference of upgrading from the typical 1970`s style rental property to plush house with all the mod cons comparatively inexpensive, when compared to the increase in mortgage payments if they had to make the move as buyers. Renting isn`t seen as the poor man`s choice because many young, and increasingly older people, are becoming more at ease and comfortable with the flexibility offered by renting a property rather than jumping ‘lemming like` into home ownership. Landlords in Worthing will continue to see growth in sector, and like Germany, todays renters will become homeowners in 20 years` time – when they will inherit the wealth of their parent`s home.